The recipe came from The Kid's Cookbook by Abigail Johnson Dodge, which I can recommend as a book aimed at children who like cooking. My son loves it and I approve of its focus on fresh, unprocessed ingredients. This one is our favourite recipe so far. Melt two-thirds of the butter and set it aside to cool. Mix the flour, baking powder, sugar and salt together. Mash up the banana and mix in the eggs, milk, vanilla extract and melted butter. Stir the liquid ingredients into the dry ones. Heat a griddle or frying pan with the remaining butter and scoop ¼ cupfuls of the mixture into it. My frying pan fits three at a time. Turn the pancakes after about two minutes and cook for another 30 seconds or so on the other side. This amount of mixture makes about 15 4-inch pancakes. 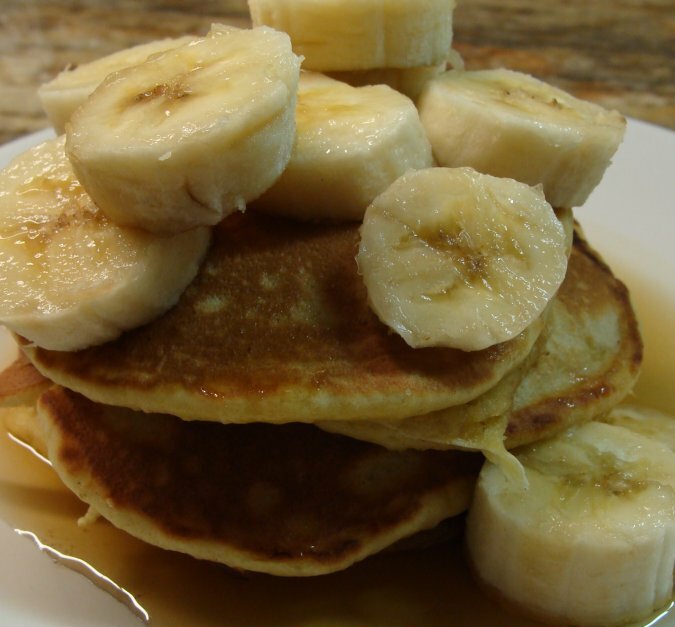 Serve them with some sliced banana and maple syrup. I can't pretend that the bananas were a local ingredient, but the maple syrup was!